Well, the holiday weekend (US Memorial Day) is winding down. It’s been a glorious, gorgeous weekend. And I really don’t want to go into work this week – deadline central. Overtime is guaranteed, which means knitting time will be almost nil this week. However…OK, I have to confess. After this weekend, I really can’t begrudge the overtime. It was the annual Great Lakes Fiber Show. And I may have gone a little overboard with the purchases! 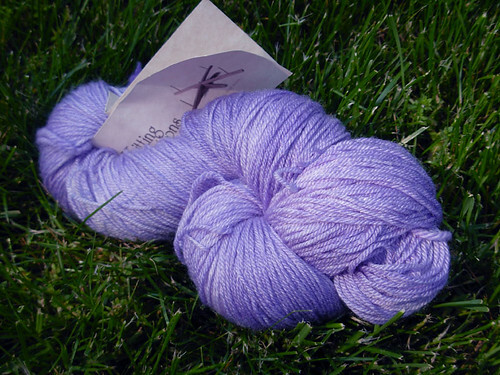 (1) skein Classic Merino Lace, colorway Lilac. I believe this is destined for Crocus Pocus. 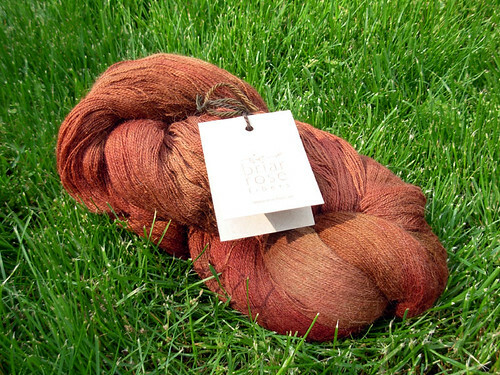 (1) skein, 2500 yards, of Angel Face, an alpaca laceweight. 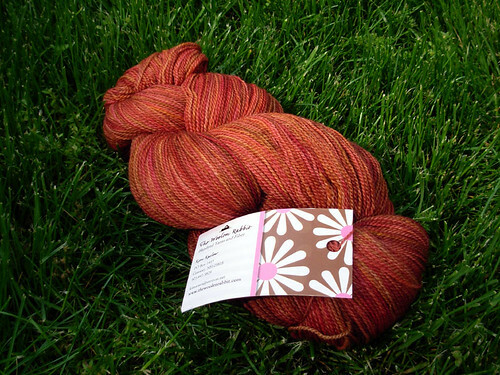 I’m pretty sure this will be fall knitting, probably as the Aeolian Shawl. 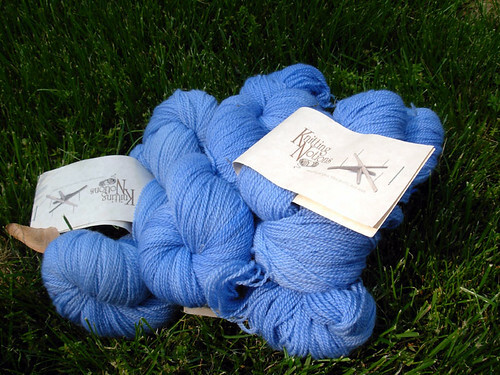 (1) double skein (1000 yards) Sea Pearl, a wonderful merino-tencel blend. I’m currently thinking this might become a Trevi shawl, although I’m not 100% certain. 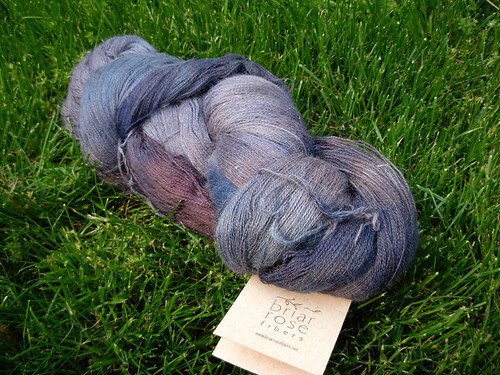 I have to just say, Chris’s (Briar Rose) yarns are absolutely lovely. I don’t think there was a single skein in her booth that wasn’t gorgeous. And she’s really nice, too. I can see why Anne has colaberated with Chris so often! The final yarn purchase was my real splurge. I’ve been thinking for a while that it would be nice to have a natural-brown sweater or cardigan. So, when surrounded by all those yarns and all those temptations, I came across this handspun, I gave in. According to the tag, it’s a 70% Border Leisceter, 15% silk, 15% alpaca blend. The seller was from Michigan, and doesn’t appear to have a web site. I don’t know enough about handspuns to know what the quality of the spinning is, but it’s pretty to look at. I got three skeins, which should be enough for a nice sweater. I’m not sure what yet. I do know that I’m not going anywhere near it until the cooler fall weather! 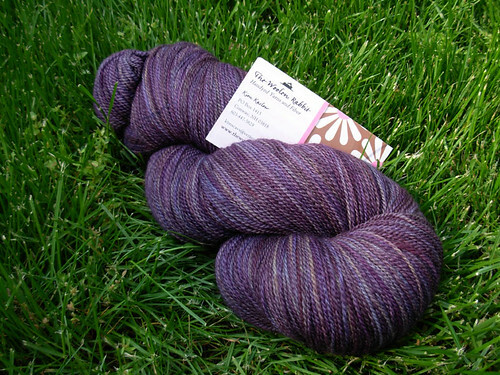 (1) skein Angel Face. It’s actually a deeper lavender/eggplant than the picture shows. I’m not sure what this will become. 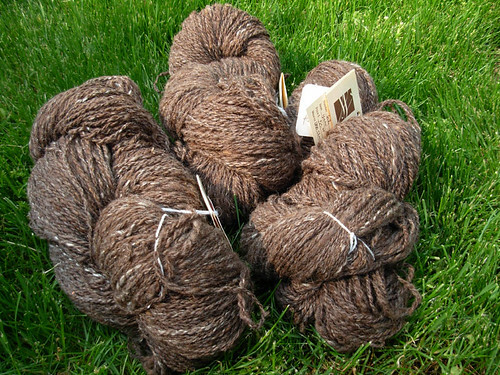 And finally, (1) skein of Merino Laceweight, colorway Chocolate Chambard. This will become Iris. In sum, I think that I have more than enough yarns to keep me busy for probably a couple years! I also had reached the point where yarns seemed to be spilling out everywhere, so I took some time this morning and sorted and shelved my yarns (and needles). I think everything’s now neatly in a home so I can knit without the dreaded cloud of a yarn mess hanging over me. Now if only I could decide which project to knit! That’s a great collection of yarn! 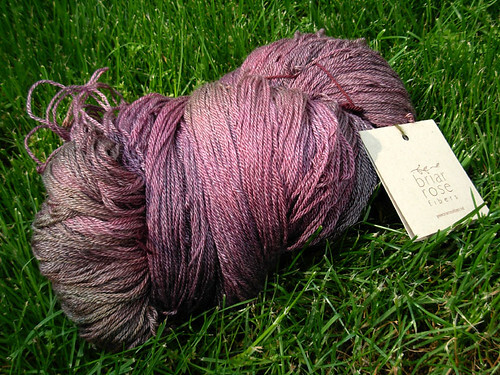 I’ve been tempted several times by the Briar Rose yarns; I think the only thing that’s saved me is my aversion to buying yarn online. They’re certainly beautiful! I love the colors you picked, too. Fall will be fun!